It's Week 5 of Calling it Home's One Room Challenge and we're in the home stretch! Art and curtains are going up tonight and tomorrow is all about finishing a couple of DIYs and final styling! The spaces I create are fresh and happy, with vintage touches, and look like they’ve been pulled together over time. I combine antique and vintage elements, colour, texture, beautiful fabrics and original art to create perfectly imperfect spaces that are as unique as those who live in them. Sustainability is at the root of everything I do and my creative process starts by working with pieces clients already have and love. 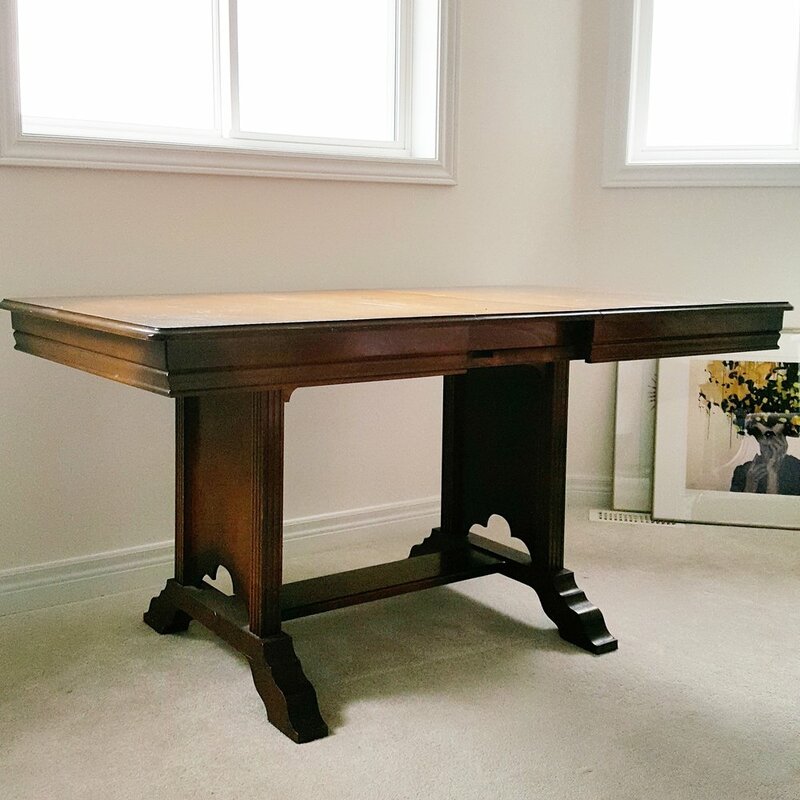 My Grannie Audrey also had a deco secretary desk in her home that was always filled with anything and everything - rubber bands, old stamps, buttons, pens, old Christmas cards - you name it, it was in there. Growing up during the depression will do that to you. Her secretary desk was handed down to my Mom so one day I asked her: "Could I have Grannie's secretary desk?" fully expecting the answer to be an immediate "yes!". Well it couldn't have been further from a yes and instead it was an "It's going to your sister". I did my usual prodding and prying but my Mom was not budging an inch so I knew I had to take matters into my own hands and find my own on Kijiji! I looked for a few weeks and there were so many but they were tall, ornate French Provincials or roll tops - not remotely Art Deco. Finally I found one that was really close with the original Bakelite hardware for a steal! I sent a picture of it to my parents and my Dad bought it for my birthday. Now it means more to me than my Grannie's would have :) I have a few styling tricks planned for this piece for the final reveal. I recently found another great piece on Kijiji in the last couple of weeks - a chartreuse green velvet vanity chair! 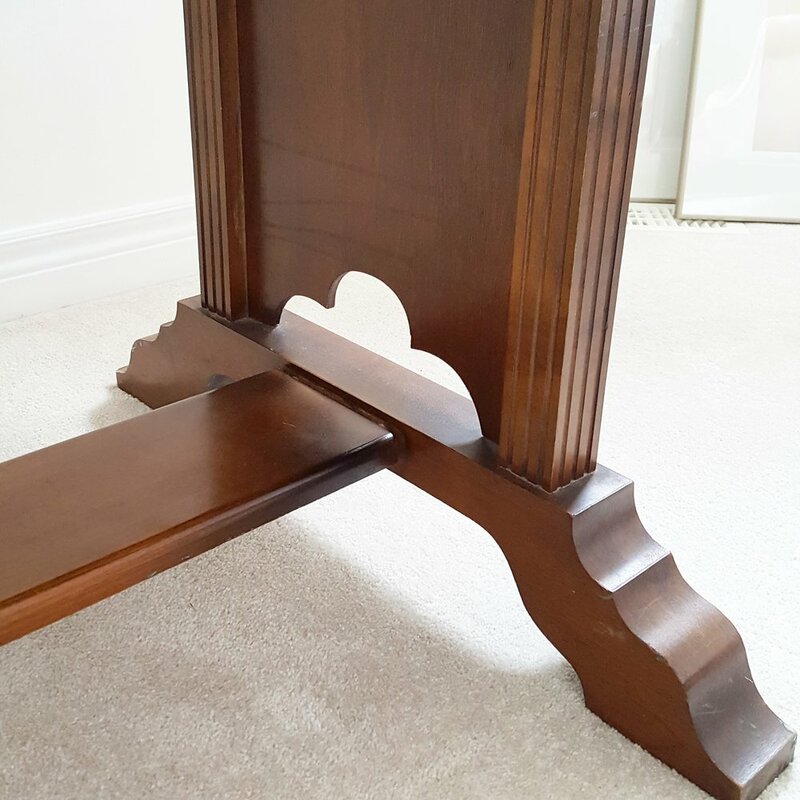 This piece is definitely well loved but I think she's absolutely imperfectly perfect just the way she is - no reupholstery required. Earlier this summer my Mom, sister Erin, my munchkins Matthew and Lily and I went to the Christie Antique & Vintage Show. Instead of arriving first thing we arrived in the afternoon and explored every inch of the show. Matthew gravitated towards old tools and guessed what they might have been used for and Lily went straight for vintage jewellery, paperweights and old rotary phones (this one was a surprise). I bought a pretty floral oil painting that came from an estate sale and walked past a really great wing chair with a price tag of $350 on it. Well over what I was willing to pay, I tried to forget about it but I just couldn't. My Mom and I have been at shows before when it was cold and rainy - great deal days. I've also been at shows at closing and knew that you can usually get a great deal on larger pieces because vendors don't always want to take them home. We went back to the chair vendor with only 20 minutes remaining in the show and it was still there. "You need another chair like you need a hole in the head!" said my Mom. I looked at the vendor and asked "How much?" :) He said "Make me an offer" but at a starting price of $350 I didn't think I would get a bargain. He said "How about $75?" and I said "How about $50?". As you can see below the chair came home with us! The original yellow/pink two-tone velvet was really faded and the seat padding was non existent. I really wanted to have her reupholstered in a yellow velvet again but I saw this mauve velvet at Fabricland and at just $8 a metre it was too good to pass up. She has now been completely restored and will be on of my forever pieces. Our carpeting will be replaced with hardwood in the near future so I've been on the hunt for runners and rugs. I've purchased three rugs this year - two for the kids' rooms and one for our living room all from my favourite Antiques on 11 North. As a result, I'm now referred to as "The Rug Lady" there :) I'm ok with that because they are now calling me when rugs arrive that they think I will like! A few weeks ago on Kijiji Canada's Instagram account, I saw a post from vintage hunter extraordinaire Catherine Coe of Charcoal and Teak. 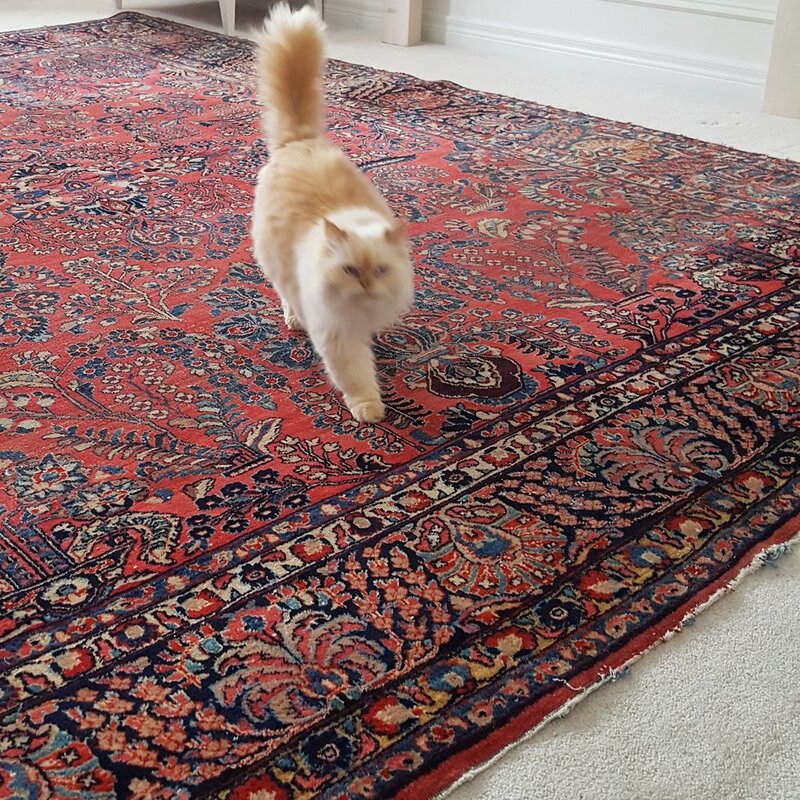 She has an amazing eye for all things vintage including rugs! 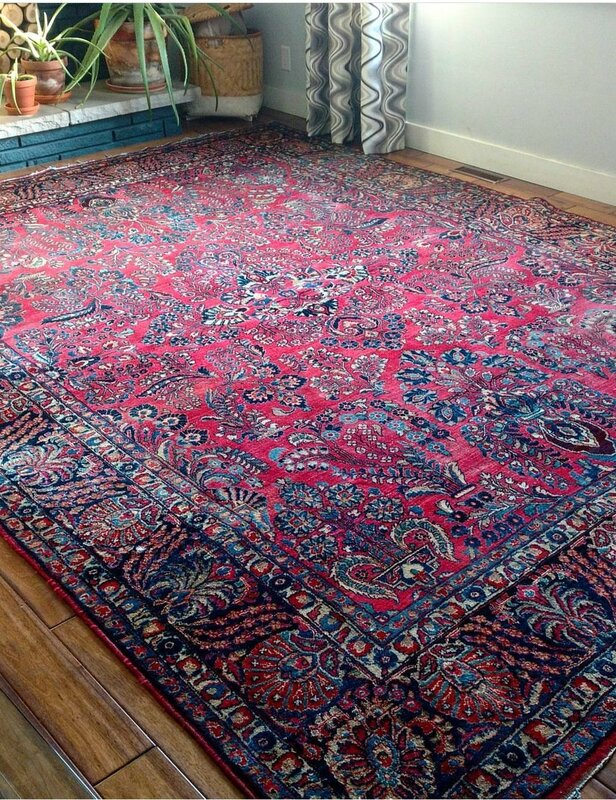 I started following her immediately and just last week she decided to sell one of her gorgeous rugs (a 9x12 hand knotted Persian in my signature pink and blue colours) on an Instagram auction! Two weeks left and so much more to share but you'll just have to wait until next week! Be sure to check out the amazing work of the One Room Challenge's Featured Designers and Guest Participants. Until next week!